The phone call no mother wants to get is the one Sally Yabra received. Her world as she knew it forever changed when her handsome 19 yr. old son Jonathan Baksh died in a quarry related accidental drowning last summer. Below you will find his story told in her words via Change.org where there’s a petition awaiting your signature to make a difference. I promised to share his story…and it’s an honor to do so. 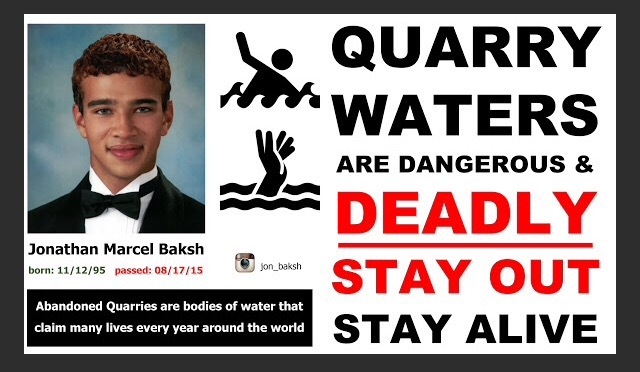 Abandoned Quarries claimed the lives of over forty people in the United States last year alone, including my 19-year-old son Jonathan Baksh. He was an excellent swimmer, but was unaware of the dangers abandoned quarries pose, when he traveled out of state to go swimming with his friends. He grew up in an area where there are no quarries, therefore quarry safety education programs were not taught at our schools, and quarry danger was not common knowledge in our community. Quarries and mines are a fundamental part of the economy and are located in every state in the U.S. Once they are no longer financially viable, they are often abandoned and naturally become filled with underground water. On a hot summer day, they may look like the perfect place for a swim, but they are dangerous and deadly. – Hidden underwater dangers such as sharp objects, old machinery, junk cars, debris, etc. The U.S. Department of Labor, Mine Safety and Health Administration (msha.gov) created a program Stay Out Stay Alive which is intended to educate the public about the dangers of abandoned mines. Unfortunately, the program is underfunded and too many lives are lost each year because young people do not learn of the dangers which abandoned mines and quarries pose. Awareness of the dangers of ABANDONED QUARRIES has to be initiated in form of a public safety campaign. We request that the existing campaign STAY OUT STAY ALIVE – http://www.msha.gov be enacted as part of national awareness program in our schools similar to road safety or anti-drug campaign. Photo courtesy of Mineral Products Association of Northern Ireland. Many thanks to the Department of the Environment, Northern Ireland for sources and information. Photo Credits Sally Yabra & Mineral Products Association of Northern Ireland. No copyright infringement intended. Thank you for reading Kitt! Much appreciation! Previous Previous post: WELCOME TO AUTHENTICITEE SPEAKS!